Glistening Waters' Luminous Lagoon is one of the most incredible spots in the world. Come see the natural beauty that Mother Nature has to offer. Often decribed as 'Amazing' and 'Unbelievable', this glowing lagoon will amaze and fill you with wonder. Come take an amazing tour of the Luminous Lagoon. This natural wonder is a phosphorescent lagoon located in Falmouth, where guests are taken on a beautiful night cruise. When disturbed, the microscopic organisms in the water glow and creates and eerie, glistening light. This phenomenon is said to only occur in only 3 places in the world. the luminous micro-organisms at Glistening Waters really are something to see. flow into a shallow lagoon of colder sea water allowing the luminous micro-organisms to thrive. I (Bob) was able to swim in the water at night and my movements in the water caused these organisms to glow brightly. It was a fascinating experience. Unfortunately it is almost impossible to capture, but you can visit their web site. Whether you wish to get in the water or watch from the safety of the boat, we recommend you pay them a visit. 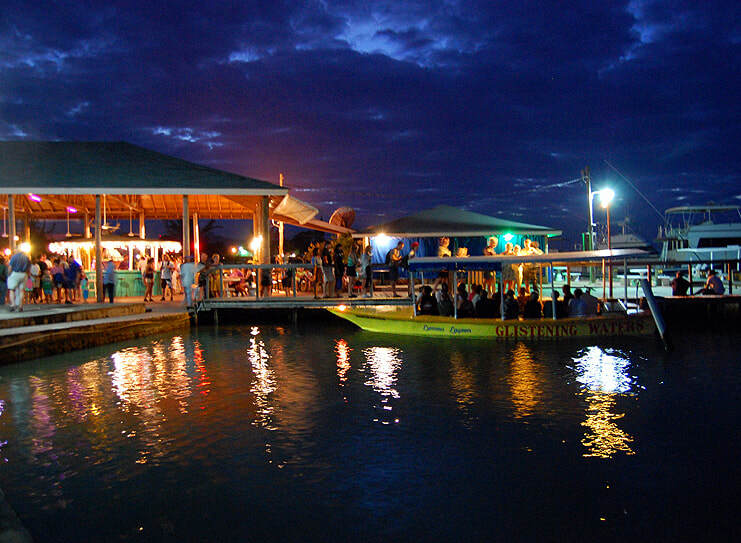 Boat tours run every night starting at 6:30 p.m. and ending at 8 p.m.
Boat tour is 30 minutes duration.